Yes, I'm starting off the Halloween recipes today! 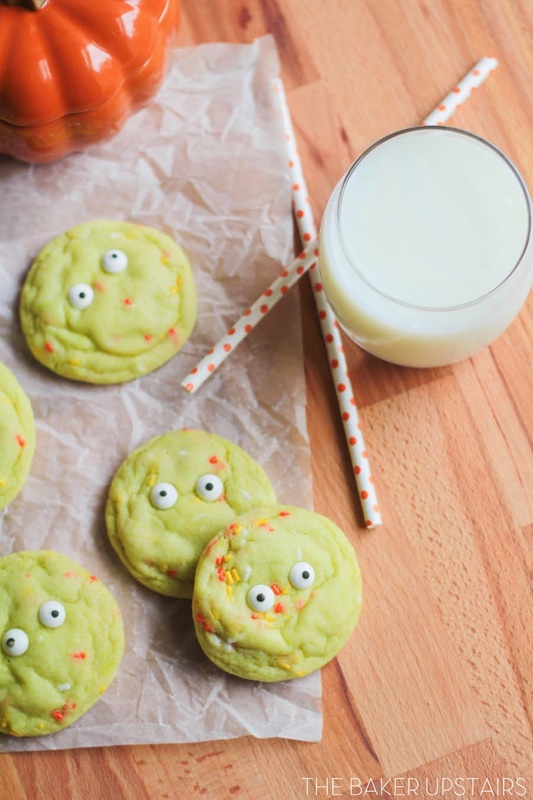 These funfetti monster cookies are totally ridiculous but perfect for Halloween. My seven year old Abby cracked up when she saw them and kept giggling over their silly googly eyes. 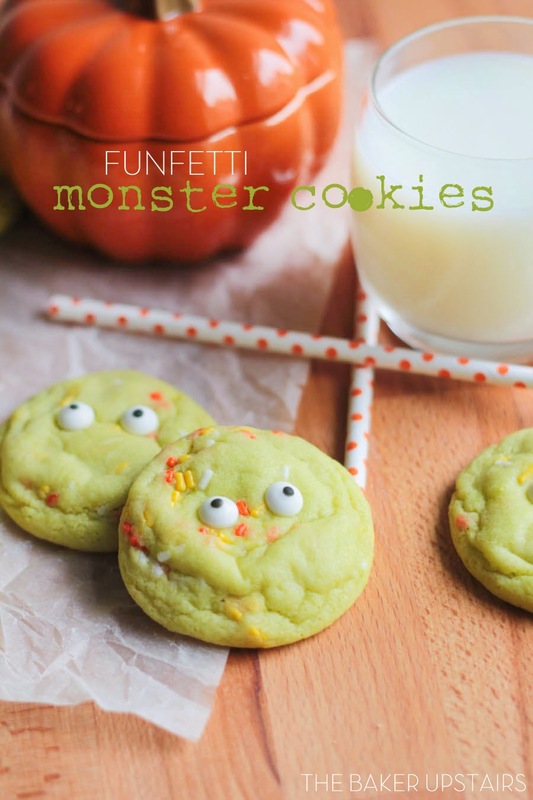 Sometimes it's fun to just be a little silly with her, and considering how much I love Halloween (and cookies), these made for a perfect Sunday dessert. 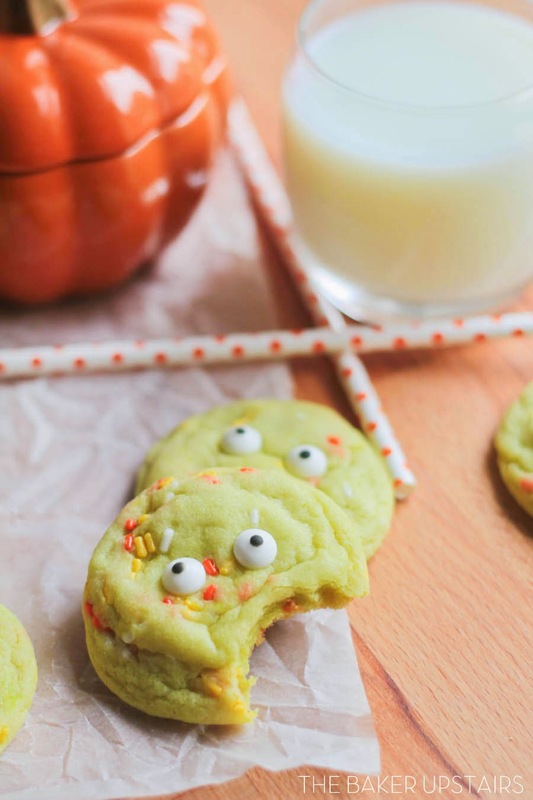 In addition to being fun, though, these cookies are also super tasty. They're soft on the inside and crisp around the edges, and have a delicious vanilla sugar cookie flavor. Yum! Preheat oven to 350. Line a baking sheet with parchment or a silicone baking mat. In a large bowl or the bowl of a stand mixer, cream together butter and sugar until light and fluffy. Beat in egg and vanilla until well blended. Add the food coloring and mix until blended. Add the flour, salt, baking powder, baking soda, and cream of tartar, and mix until a dough forms. Fold in sprinkles until well distributed. Shape into one inch balls (I got 16 balls from the dough). 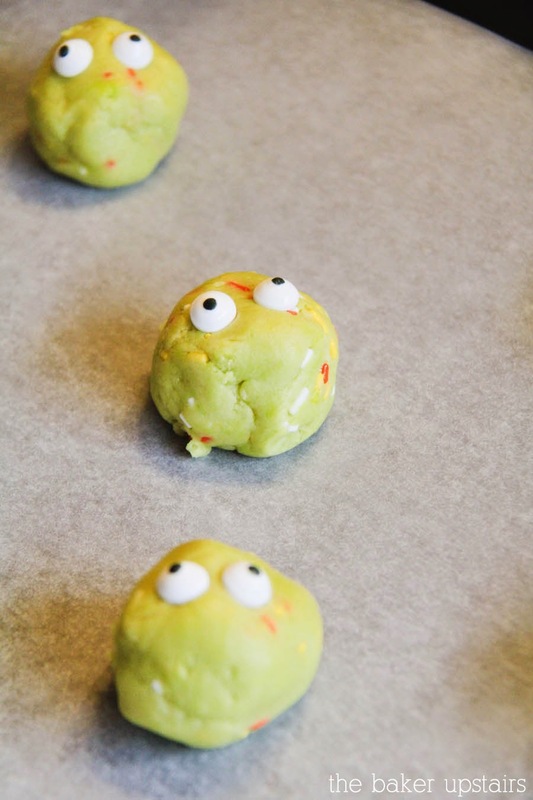 Place on prepared baking sheet and top each ball of dough with two candy eyeballs. If your dough is fairly soft, I would recommend chilling it at this point for about 30 minutes. If your dough is thick (like mine was), bake in the preheated oven for exactly 8 minutes. Remove and let cool 5-10 minutes on the baking sheet before removing to a cooling rack. The cookies will look very soft and undercooked when you pull them out, but they will cook more as they cool on the pan. Enjoy!